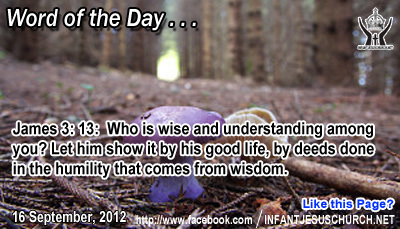 James 3:13: Who is wise and understanding among you? Let him show it by his good life, by deeds done in the humility that comes from wisdom. Heavenly Father, we know you have been a wise and loving Father to us. Help us share the care that you have generously on us with the person who most needs it today. Please guard us from arrogance and feelings of superiority, and gently humble us in the ways that make us more useful tool in your hands. In Infant Jesus' name we pray. Amen. Jesus explained to all who listen what it would individually cost them to follow him as their Lord it would cost them everything, even their especially lives! How can somebody make such a demand? God the Father liberally gave us his Son, the Lord Jesus, to save us from sin and death not just physical death other than spiritual death as well. When we substitute our life for his we receive far more that we give up. We accept pardon, peace, and the abundant life of God's kingdom now and the guarantee of the resurrection and everlasting life with God in the age to come. When we find out the treasure of God's kingdom God himself we willingly give up all that we have in exchange for the life of joy and pleasure God offers us. God gives without measure. The joy he offers no grief or loss can diminish. The cross of Christ leads to victory and freedom from sin and death. What is the cross which Jesus Christ commands me to take up each day? When our will crosses with his will, then his will must be done. Are we prepared to lose all for Jesus Christ in order to gain all with Jesus Christ?